One of our readers in Laguna Beach, California, Jack, sent us these photos of a bicycle he built up for his wife, who is Danish. We're loving the custom wine rack. 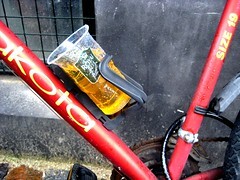 Why wine or beer racks are not standard on Danish bicycles we'll never know. But at least that little holder thingy on the frame can be used for something, because it sure as hell can't hold a café latte. We like Jack's idea better.